Mikhail Grigorenko shot CSKA into the Gagarin Cup final for the second time in three seasons, bagging a late equalizer and an overtime winner as the Muscovites recovered a 0-2 deficit to beat SKA. However, if CSKA goes on to lift the Gagarin Cup for the first time, Lars Johansson’s save midway through the first period of overtime could well be remembered as one of the key moments of the campaign. The goal gaped at Pavel Datsyuk’s mercy after Alexander Barabanov forced a big save from Johansson, but the Swedish goalie somehow got his pad across the crease to stop the shot and keep his team in the game. Within a couple of minutes, Grigorenko put away his second of the night and CSKA had its place in the grand final. For Johansson, it was the highlight of another stellar performance. After his shut-out in Friday’s victory in St. Petersburg, the Swede might have anticipated a starting role again here in game six. Instead, CSKA’s head coach Igor Nikitin went with Ilya Sorokin, so reliable throughout the playoff campaign up to now. The decision almost backfired horribly. SKA, well aware that only victory would prolong its defense of the Gagarin Cup, began at a blistering tempo and ripped into a two-goal lead inside five minutes. The first, from Nikita Gusev, was a clear goaltending error: the forward made an impressive rush from his own end and turned Bogdan Kiselevich inside out, but his shot came from a long way and Sorokin had a clear view before he inexplicably flapped his glove away from the puck as it flew into the net. A couple of minutes later, Ilya Kovalchuk added a second. No goalie error this time: SKA’s alternate captain sliced through the CSKA zone before firing through traffic to give Sorokin no chance. Unluckily for the youngster, he would get no further chances in this game as Johansson came to the crease after just four minutes of play. The change paid off, the Swede was once again in unbeatable form. 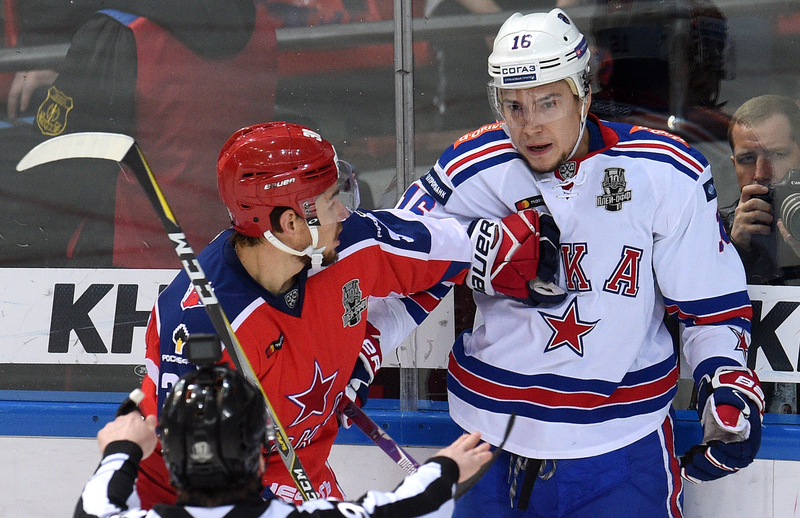 In total, SKA had 35 shots in the game, but it was unable to add to the two goals it scored on Sorokin. But CSKA still had to recover that deficit and salvage something from the game. It took some time to make that happen. SKA’s early momentum kept it on top until well into the second period. But gradually the home team began to fashion opportunities of its own and, in the 36th minute, a well-worked counter-attack halved the deficit. Maxim Shalunov’s surge down the right wing got CSKA into position and Nikita Nesterov came surging up from defense to convert his team-mate’s enticing feed. That goal gave CSKA hope, but in the third period it seemed that SKA had enough to hold on to its lead. The host was stretched, with most of the defensive work happening at its end. SKA had 10 shots on goal, and a further seven were blocked as the clock ticked ever closer to the 60-minute mark. Then it happened. With three-and-a-half minutes left to play, Grigorenko turned the game – and perhaps the season – upside down with a tying goal. It wasn’t the prettiest goal of the playoffs: Alexander Popov followed up after CSKA dumped the puck into the corner and wrestled possession away from Anton Belov. His feed from behind the net went straight to Grigorenko’s tape, and his one-timer whistled past Mikko Koskinen to level the scores and take the game into overtime. In the absence of Kirill Kaprizov, rested after his game-winning exploits on Friday, CSKA found a new hero. The extras brought that fantastic Johansson save, and then a second Grigorenko goal. Again, Popov won his battle in the corner. This time Kirill Petrov took on the puck and unleashed a shot on the wraparound. Koskinen padded it away, but Grigorenko was on the spot to smash home the rebound and send CSKA into the grand final. CSKA’s victory sets up a Gagarin Cup Final showdown against Ak Bars, with game one scheduled for Saturday, April 14 in Kazan. It also means that once again, the KHL’s regular season champion will not lift the big prize: never in the 10 seasons of KHL action has the team on top of the table gone on to win the Gagarin Cup.